If you are looking for a fun and affordable outing for the family in the DFW area, then don’t miss out on this great offer and catch an action packed game of hockey. 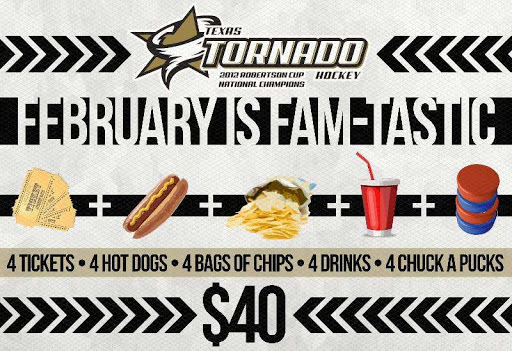 Texas Tornado Hockey has a great deal going during the month of February. For only $40 you will receive 4 tickets, 4 hot dogs, 4 bags of chips, 4 drinks and 4 Chuck A Pucks!! Wondering what a Chuck a Puck is? It is your chance to win $$!! During the second intermission, you will have the chance to throw your puck and take aim at the Robertson Cup at center ice. If you make it into the tropy, you win! The jackpot on February 7th is $525 dollars, if no one makes it in then the jackpot grows by $25 per game. Call 972-335-9800 to take advantage of this offer. Previous postReminder ~ Hollywood Theaters 1/2 off Tuesdays!